In early 2014 there were unusual news stories about Gallup’s end-of-2013 polling because after polling in 65 countries with the question “Which country do you think is the greatest threat to peace in the world today?” the overwhelming winner had been the United States of America. Had Gallup then conducted a poll on whether Gallup would ever ask that question again, I’m willing to bet large numbers would have said no. And thus far they would have been right. But Gallup managed to ask some other good questions, almost certainly by accident as well, in its end-of-2014 polling, revealing something else about the United States and militarism. Curiously, Gallup’s end-of-2014 polling managed to ask a lot more questions — 32 instead of 6 and even squeezed in one on whether people wash their hands after using the bathroom — so the threat-to-peace question wasn’t dropped for lack of space. In both the 2013 and the 2014 polling, the first question is whether people think the next year will be better than the last, the second whether their country’s economy will do well, and the third whether the person is happy. This sort of fluff is odd, because Gallup advertises the polling with this quote from Dr. George H. Gallup: “If democracy is supposed to be based on the will of the people, then somebody should go out and find out what that will is.” So, what policies do the people want? Who the hell can tell from this sort of questioning? If there were no barrier to living in any country of the world, which country would you like to live in? If politicians were predominantly women, do you believe the world would in general be a better place, a worse place or no different? Which country do you think is the greatest threat to peace in the world today? And that’s it. 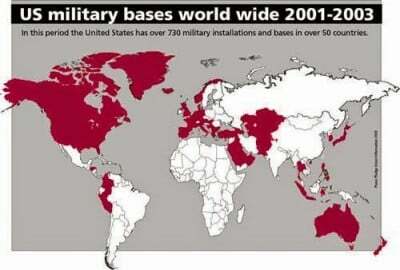 There’s nothing like Should your government invest more or less in militarism? or Should your government expand or reduce support for fossil fuels? or Does your government imprison too many or too few people? or Do you favor greater or less public investment in education? The questions Gallup asks are supposed to produce fluff. What happened is that the last question ended up producing a substantive response by accident. When the rest of the world declared the United States the greatest threat to peace (the people of the United States gave Iran that designation) it amounted to a recommendation to the U.S. government, namely that it stop launching so many wars. We can’t have that! Polling is supposed to be fun and diverting! Compared to this year, do you think that 2015 will be a more peaceful year freer of international dispute, remain the same or a troubled year with more international discord? What a great polling question, if you don’t want to learn anything! Any discord is equated with the opposite of peace, i.e. war, and people are asked for a baseless prediction, not a policy preference. If there were a war that involved [your country’s name] would you be willing to fight for your country? This reduces respondents from citizen sovereigns to cannon fodder. It’s not “Should your country seek out more wars?” but “Would you be willing to commit murder on behalf of your country in an unspecified war for an unstated purpose?” And again, Gallup accidentally revealed something here, but let’s come back to that after listing the rest of the questions (feel free to just skim the list). Do you feel that elections in [your country’s name] are free and fair? To what extent do you agree or disagree with the following statement: [your country’s name] is ruled by the will of the people. To what extent do you agree or disagree with the following statement: Democracy may have problems but it is the best system of government. Which of the following is more important to you: your continent, your nationality, your local county/state/province/city, your religion, your ethnic group, or none of these? Irrespective of whether you attend a place of worship or not, would you say you are a religious person, not a religious person, or a convinced atheist? How sympathetic or unsympathetic would you say you feel toward those who come to your country for the following reason: lack of political or religious freedom in their country? How sympathetic or unsympathetic would you say you feel toward those who come to your country for the following reason: to join their family who are already in the country? How sympathetic or unsympathetic would you say you feel toward those who come to your country for the following reason: fleeing persecution in their country? How sympathetic or unsympathetic would you say you feel toward those who come to your country for the following reason: wanting a better life? How sympathetic or unsympathetic would you say you feel toward those who come to your country for the following reason: escaping sexual or gender discrimination? How sympathetic or unsympathetic would you say you feel toward those who come to your country for the following reason: escaping war or armed conflict? Overall do you think globalization is a good thing, bad thing, or neither good nor bad for the USA? Do you trust or distrust the following groups of people: Judges? Do you trust or distrust the following groups of people: Journalists? Do you trust or distrust the following groups of people: Politicians? Do you trust or distrust the following groups of people: Business people? Do you trust or distrust the following groups of people: Military? Do you trust or distrust the following groups of people: Healthcare workers? Do you trust or distrust the following groups of people: Police? Do you trust or distrust the following groups of people: Teachers? Do you trust or distrust the following groups of people: Bankers? Do you trust or distrust the following groups of people: Religious leaders? To what extent do you agree or disagree with each of the following statement: We should not allow corrupt foreign politicians and business people to spend their proceeds from corruption in my country. To what extent do you agree or disagree with each of the following statement: The Government is effective at preventing corrupt politicians and business people from spending their proceeds from corruption in my country. To what extent do you agree or disagree with each of the following statement: The Government should require companies to publish the real names of their shareholders and owners. How strongly do you feel that your mobile device (including mobile phone and other hand held devices) enhances your quality of life? To what extent do you agree or disagree with each of the following statement: Washing my hands with soap after going to the toilet is something I automatically do. Now, something interesting might be gathered from any of these questions, even the soap one. It’s interesting that in religiosity the United States resembles the places it wages war on, as opposed to the places its military is allied with which have virtually no use for religion. And the questions on corrupt investment and shareholder transparency almost seem like policy questions, although the predictably one-sided responses give them a dog-bites-man non-news quality. Which Nations’ Populations Are Most Accepting of More Wars? This question is quite interesting because of the answers given around the world: “If there were a war that involved [your country’s name] would you be willing to fight for your country?” Now, if your country were under attack or recently under attack or threatened with attack, that might, I suppose, lead you toward a yes answer. Or if you trusted your government not to launch offensive wars, that too — I’m guessing — might lead you toward a yes answer. But the United States routinely launches wars that, before long, a majority of its population says shouldn’t have been launched. What percentage of Americans will nonetheless say they’re theoretically willing to join in any war whatsoever? Of course, the question is a bit vague. What if “a war that involved the United States” were taken to mean the actual United States and not the affairs of its government thousands of miles away? Or what if “fight for your country” were taken to mean “fight in actual defense of your actual country”? Obviously such interpretations would add to the yes answers. But such interpretations would require serious distance from reality; those aren’t the kind of wars that are waged by the United States. And very clearly people who answered this survey in some other parts of the world tended not to use such an interpretation. Or even if they understood the question to involve an attack on their nation, they did not see war as a viable response worthy of their participation. In Italy 68 percent of Italians polled said they would NOT fight for their country, while 20 percent said they would. In Germany 62 percent said they would not, while 18 percent said they would. In the Czech Republic, 64 percent would not fight for their country, while 23 percent would. In the Netherlands, 64 percent would not fight for their country, while 15 percent would. In Belgium, 56 percent would not, while 19 percent would. Even in the UK, 51 percent would not participate in a UK war, while 27 percent would. In France, Iceland, Ireland, Spain, and Switzerland, more people would refuse to be part of a war than would agree. The same goes for Australia and Canada. In Japan only 10 percent would fight for their country. What about the United States? Despite waging the greatest number of most baseless and most costly wars, the United States manages 44 percent claiming a willingness to fight and 31 percent refusing. By no means is that the world record. Israel is at 66 percent ready to fight and 13 percent not. Afghanistan is at 76 to 20. Russia, Sweden, Finland, and Greece are all ready to fight with strong majorities. Argentina and Denmark have ties between those who would fight and those who would not. But look at the incredible contrast in the two places I’ve lived, for example: the United States and Italy. Italians clearly view it as largely unacceptable to say you would participate in a war. The United States has 44 percent saying that despite the destruction of Iraq, despite the chaos brought to Libya, despite the misery added to Afghanistan’s lot, despite the destabilization of Yemen, despite the costs even to the aggressor and despite the world believing the United States to be the greatest threat to peace on earth, those 44 percent at least feel obliged to claim they would participate in an unspecified war. Are those 44 percent rushing to the recruitment offices to get trained up and be ready? Luckily, no. It’s just a poll, and we all know how Brian Williams and Bill O’Reilly would have answered it, but even lies told in polls reflect cultural preferences. The fact is that there is a sizable minority in the United States that has never believed any of its recent wars were crimes or blunders, never questioned trillion dollar military spending, and never desired a world without war in it. Trying to explain that to people from the Netherlands can be like trying to explain why Americans don’t want healthcare. The gap is wide, and I thank Gallup for accidentally revealing it. Further study is needed to find the roots of the relative degrees of militarism revealed.